Podcasts, essays, and thoughts on the weird, strange, and wondrous. I have started working out, and to pass the the time I listen to audiobooks. One I have recently chosen is an unabridged audio performance of Shirley Jackson's "The Haunting of Hill House." "Hill House," adapted into a famous 1963 film version directed by Robert Wise and an utterly abysmal remake in 1999, is, I will argue, one of the greatest ghost stories ever penned. 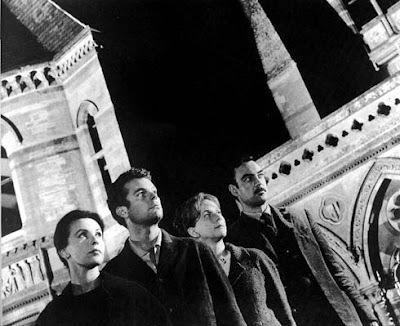 The 1963 black and white film stands as well as one of the best ghost stories ever put to film. You should watch it. Shirley Jackson was a wonderful narrativist. You probably encountered her somewhere along the way for her short story, "The Lottery," in which a seemingly idyllic town harbors a dark secret. But "Hill House" is a bonafide masterpiece, a tense, deeply psychological, visceral read that gets its hooks into you and refuses to let go. Some of it is dated. Doesn't matter. It is the music of Jackson's language that draws you in, lets you hear, see, touch, feel, and even taste the dark essence of Hill House, a house "born bad," a brooding pile that some think should be burned to the ground -- and the earth sown with salt. There is great ambiguity in the story. Is Eleanor, the primary protagonist, crazy? Or is the spiral into madness and despair she experiences the plan of something hidden and sinister? What, exactly, haunts Hill House? Is the house itself in some manner alive? We never truly know, and that makes the tale all the more frightening. The inexorable feeling of dread persists throughout the work, building to an in some ways inevitable conclusion. It is, in a word, wondrous. The story also makes use of several of the conventions of fairy tales, and there is a dreamlike quality to the writing style throughout. Tonight, I listened to a famous scene in which the supernatural seems to manifest in the house in such a manner that the house -- or whatever lies within -- separates the party of four paranormal investigators within. It is a breathtaking sequence, made somehow all the more real and potent by the fact that it is being spoken, the words echoing through the cathedral chambers of my skull and reverberating up and down my spine. The scene started as I was winding down, and so I took the moment to sit and listen intently as it unfolded. In our workout room, the windows are tinted. But for some reason, the tint was applied backward, which means that you can see in perfectly from the outside but that you can't really see out as well while you are in. It is in some ways an unnerving arrangement on a good night, and a night in Hill House ... well, let's just say I was rather careful leaving. Still listening to the recording, I walked outside. A chill night wind blew up, rattling the springtime leaves, and a setting moon, a ruddy orange hanging among the post-midnight blue, dominated my gaze. The wind followed me home, and the dew that formed on the grass glittered like curious, cast-off jewels, a road to fairyland of much the sort Eleanor often fancies finding in her journey to Hill House. I made it home. My cat emerged from the bedroom, intent on going outside. But he hesitated at the open door and then eventually turned away. In time, he ventured out, but even then his footsteps were measured and light. "Hill House" is a work of unusual and affecting power. If nothing else, treat yourself to the 1963 film adaptation. But if you want a real treat, read -- or listen to -- the novel. It is well worth reading, and well worth revisiting. Now, whatever walks here ... is going to bed. I'm a working journalist in Texas with an abiding love for all things dark and terrible. I've been a horror fan since my earliest years, something that has not abated in all the time since. When I'm not at work, I enjoy creative writing, composing bad electronic music and reading books of curious and forgotten lore.